Any parent would say that potty training a child can be challenging but imagine trying to teach a cow to use a toilet. A Dutch inventor has come up with a "cow toilet" which he claims could help the environment by cutting down on the emissions caused by cow pee, Agence France Presse reported. Cows produce up to 35 pints of urine each day. Inventor Henk Hanskam believes his device, which is already being tested on a small farm in the eastern Dutch town of Doetinchem, could cut in half the ammonia produced from cow pee on the ground. "We are tackling the problem at the source," Hanskamp told the AFP. "A cow is never going to be completely clean but you can teach them to go to the toilet," he added. Cow pee is reportedly responsible for nearly half of all agricultural ammonia pollution in the Netherlands, which plays a big role in global agricultural exports. How does the cow toilet work? The cow stands inside a stall with a feeding trough in the front and a urinal in the rear. 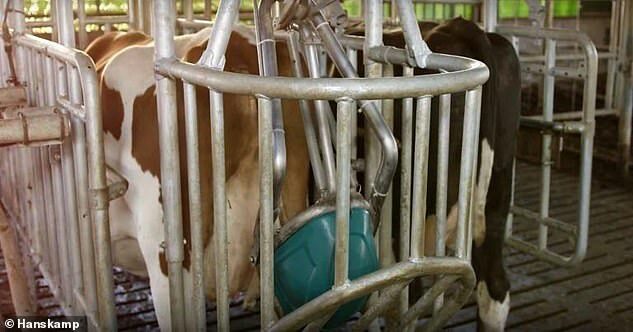 After the cow is finished eating, a robotic arm stimulates a nerve near the udders which causes the animal to pee. Seven of the 58 cows on the Doetinchem farm have already been potty trained, according to the report. In other words, they've learned to use the urinal without stimulation. "The cows have got used to it," Hanskamp told the AFP. "They recognize the box, lift their tail, and pee." Jan Velema, a veterinarian who participated in the tests, said the toilets offer additional health benefits for the cattle. "The stables have become cleaner and the ground is drier. Less damp ground is better for the health of the cows' hooves,' Velema told the De Volkskrant newspaper, according to the AFP. Is cow pee really a problem? Environmentalists claim that cow urine poses several problems to human health, contributing to worse smog, as well as other problems. When ammonia mixes with water, it can create dangerous algae blooms that can be harmful to humans. The Netherlands has begun rolling out stricter emissions on ammonia in its effort to reduce atmospheric pollution, the AFP reported. What do U.S. studies say about cattle emissions? The U.S. Department of Agricultural Research Service published last month a comprehensive life-cycle analysis on the emissions of beef cattle in the U.S. which found that cows produced about 3.3 percent of all U.S. greenhouse-gas emissions. "We found that the greenhouse gas emissions in our analysis were not all that different from what other credible studies had shown and were not a significant contributor to long-term global warming," lead researcher Alan Rotz, an ARS agricultural engineer, told Progressive Farmer. The 5-year study noted nitrogen losses coming mainly from ammonia could lead to smog, acid rain, and algal blooms which may pose a public health threat. The research was assisted by the University of Arkansas, and the National Cattlemen's Beef Association, which partially funded the study. Hanskamp told the AFP that he hopes to have the cow toilets ready to sell next year.